This Shop Has Now Closed! Hamilton Carhartt established Carhartt Inc. in Detroit, Michigan, USA back in 1889 – specialising in high quality work wear. Now, almost 120 years on, the company distributes internationally. Carhartt continues to produce comfortable, well-styled, durable work clothing and has also become a leading manufacturer of designer streetwear. This warehouse store in London's East End is the final destination for a whole range of Carhartt’s tough street-styled fashion and high quality workwear for men and women - reason? They are either samples or the previous season's left over stock. 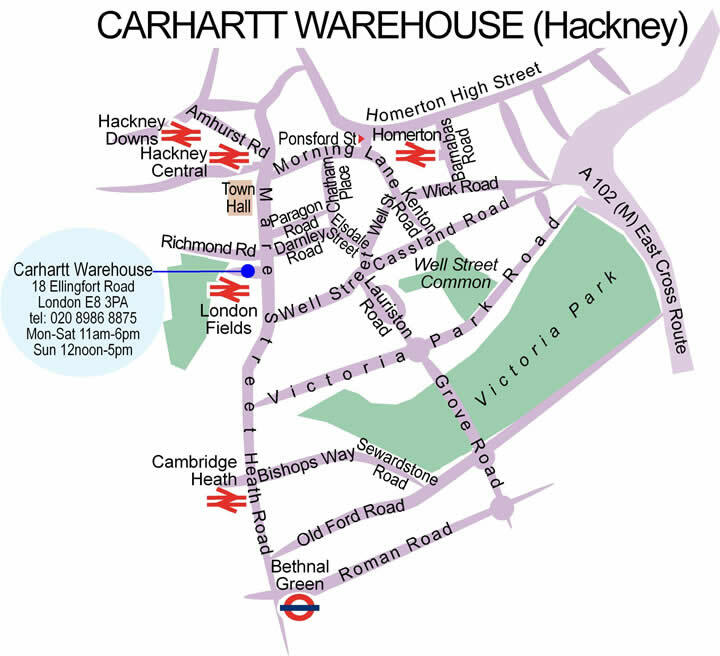 The Carhartt stores throughout the UK gather up their unsold items at the end of each season and ship them down here to the Carhartt Factory Store in Hackney and the result is, you can pick up some truly great bargains - the stock has up to 40% off the retail price. Laid out over two floors in this industrial space you'll find mostly menswear upstairs - but there is a good range of women's jeans and tops on the groundfloor. Good size changing cubicles mean you can try everything before you buy. 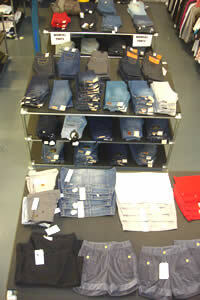 In Carhartt - jeans, jackets, hoodies, coats, tees, caps, belts and a few wallets and bags. 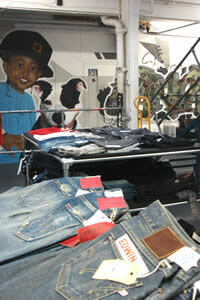 A smattering of other brands find there way here too - Japanese Edwins jeans and a few choice items from Fred Perry. Best to come on a weekday for a leisurely browse, it's busier at the weekends - staff are very laidback and helpful.